Oh hi! Today I have a super quick and easy recipe that can be served for pretty much any time of the day. 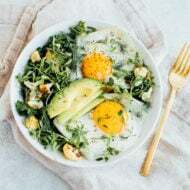 Lately I’ve been obsessed with all things eggs and avocado, eating at least half an avocado a day and totally embracing the #putaneggonit trend. But the two paired together… true perfection. You’ve got your protein. You’ve got your healthy fats. Add some additional veggies and you’re good to go. I already have an actual egg salad recipe that uses avocado instead of mayo and these baked avocado eggs. 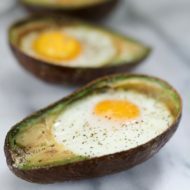 Both recipes are really good and you should try them, but I wanted to find yet another way to enjoy the egg and avocado combo. This bowl is so simple I almost feel like I don’t even need to give you all a recipe, but I’m gonna do it anyway. Mmmmkay? 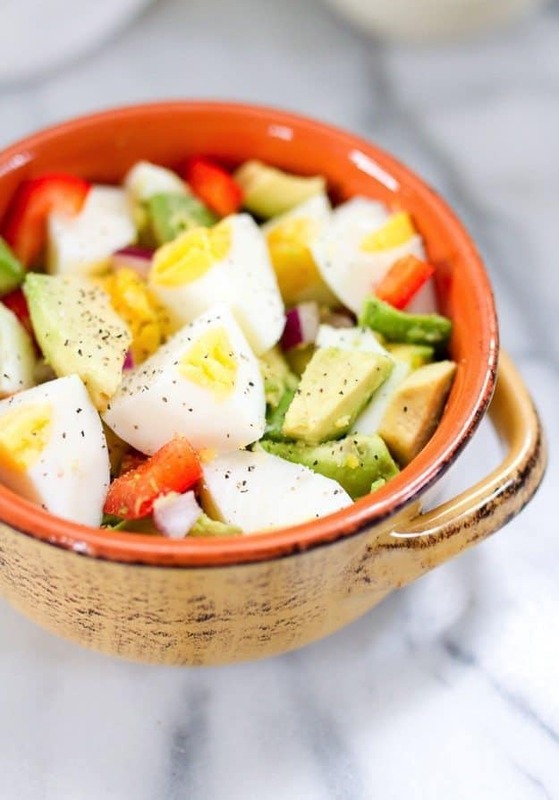 Basically you boil your eggs, chop ‘em and toss ‘em with avocado. Add in a little chopped red onion and bell pepper slices. Generously shake a little sea salt and ground pepper on top and enjoy! 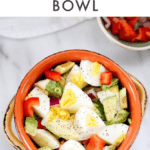 If you make this Hard Boiled Egg and Avocado Bowl be sure to leave a comment and star rating below letting us know how it turned out. Your feedback is so helpful for the EBF team and our readers! Sprinkle on sea salt and ground pepper. Oh, and do you see the cute little prep bowl with the onion and pepper in the background of my photo? It’s from Lafayette Avenue Ceramics. Jillian, the artist behind the brand, graciously sent me a few pieces to use in the EBF kitchen. I use the prep bowls when whipping up recipes but I also keep one right near my kitchen sink. It’s mainly for decor, but also as a place to put my rings if It take them off to wash dishes. I have the spoon rest as well (love it!) but I’m now thinking I need to buy myself a garlic grater. That looks so good! I’m always loking for new ways to cut back on my carbs. Thanks for sharing your recipe! You know I’m a fan of jam-packed salads and this one fits the bill!! Looks yum! I love me both of those. Hope all goes well at the summit! 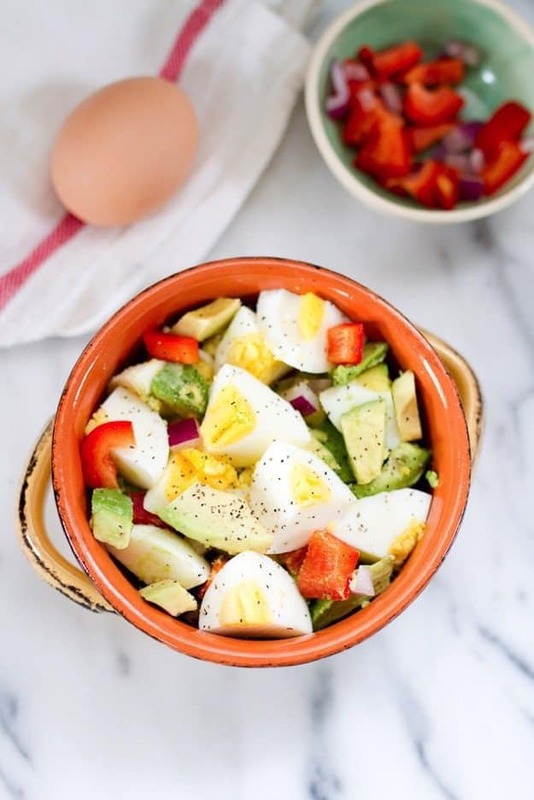 there is nothing more simple or tastier than avocado and eggs, nothing! What a delicious way to enjoy a light and filling lunch. 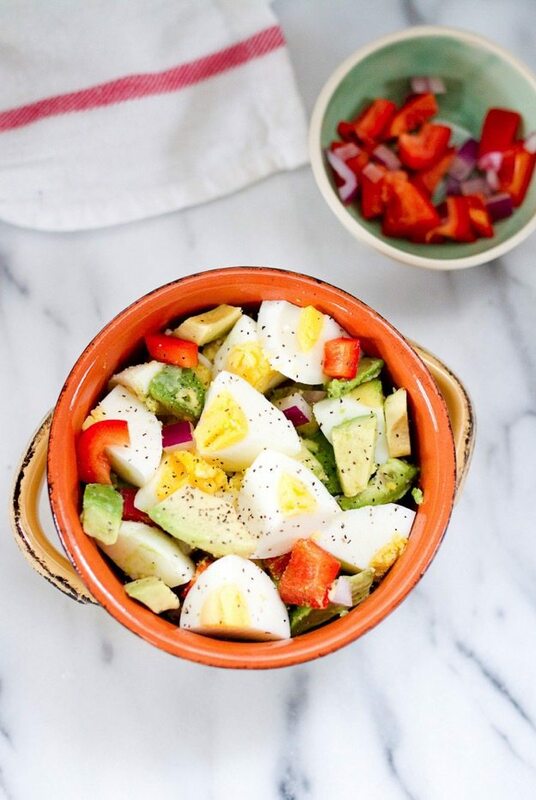 We always have hard boiled eggs in our house so this is a great way to jazz it up. Being Puerto Rican avocados are part of my life. And hard-boiled eggs sprinkled with a little cumin….. please. I have liver disease and have to be on a high protein diet to bring up my albumin levels. 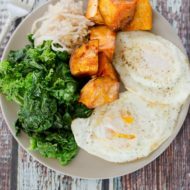 This recipe is just what the doctor ordered! Thank you soooooo much! What can I substitute with pepper bell? Broccoli perhaps? Sure! Maybe steam or blanch it so it’s a little softer. I’ve made something similar for years, with halved cherry tomatoes instead of onions and peppers. This looks so delicious — my husband works a few nights a week and this looks like the perfect meal-for-one to make so I still get something yummy and filling but don’t feel like I’m making something elaborate that only I get to enjoy! It was easy to get hooked on this salad. I’ve since made it with goat cheese and loved that too! I’ve been eating avocado/egg bowls for a couple years. My go to favorite!! I actually cook my eggs so the center is still soft (not runny) — less oxidation to the egg yolk. Then i drizzle a little olive oil and a touch of hot sauce. Sooooo good! 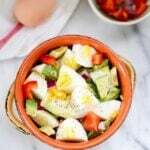 You might think is crazy Brit, but I’ve been making an egg and radish salad, with sliced hard-boiled eggs, thinly sliced radishes, a tiny bit of feta and some garlic dressing (Garlic Expressions is what I use). It’s amazing! !